Ponytails have gotten a makeover. They are being altered for an occasion or event, so to fit the ongoing trend while still bringing something new to the table. They are opening avenues to be casual, modern, feminine and boyish, all at once. We’re seeing high ponytails with sportiness, a side ponytail with a mermaid braid or a low ponytail at the nape of neck. The 1960s ponytail is of the kind that can be instantly marked as a 2013 hairstyle you can wear right now. It has a timeless elegance, and yet it’s ultimately relaxed. 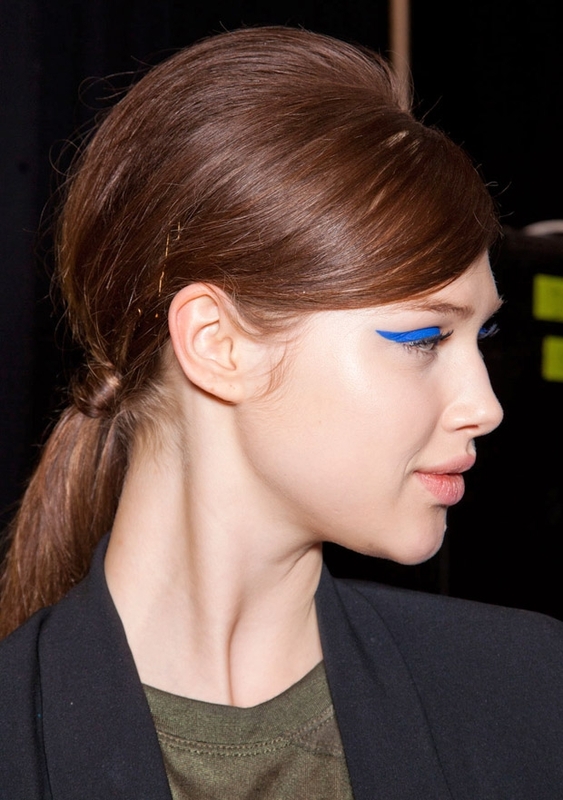 Pair it with brightly coloured liquid eyeliner for an even punchier mod look, as seen on the runway. The three-dimensional, heavily backcombed section at the crown effectively works in highlighting the traditional low ponytail and bringing a modern edge to the look. This style of ponytail can be worn on a date night or for a summer picnic in the park. It’s truly versatile!! !